Congratulations to all the local winners from Fantasy Cheltenham 2015. In total Erin’s Own had 30 winners with Donal Dunne (Runners) giving it a great go right to the end for the overall prize. Thanks to all our hard working committee members with special note to Martin Carroll for providing the Enterprise Centre as a centre of operation again this year. Thanks also to all members and their families who helped in any way throughout the campaign. Excellent as ever. Thanks also to Castlecomer Community School transition year students, to Peter O’Donovan and Delia O’Donohue for their ongoing support. To Ticket Sellers and to the people who purchased Tickets, particularly members and parents. This fundraiser is directly focussed on the new development in Ballycomey. Every cent raised goes towards this development that all of our members and their families will hopefully be able to avail of. Finally thanks to all participant clubs for their enthusiasm and support and in turn we hopefully are providing each of you with an important source for ongoing fundraising. Reminder that Bord na nOg AGM takes place on Thurs 13th Oct at 8pm in Ballycomey club rooms. Please attend where possible. 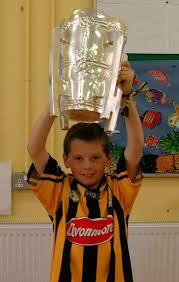 Little memory back in 5th class in School….. Little did ye both know back then…. Kevin Smith, Lee Holden, Killian Hogan, Christopher Korff (capt), Billy O’Neill, Kevin Holland, Darragh O’Rourke. 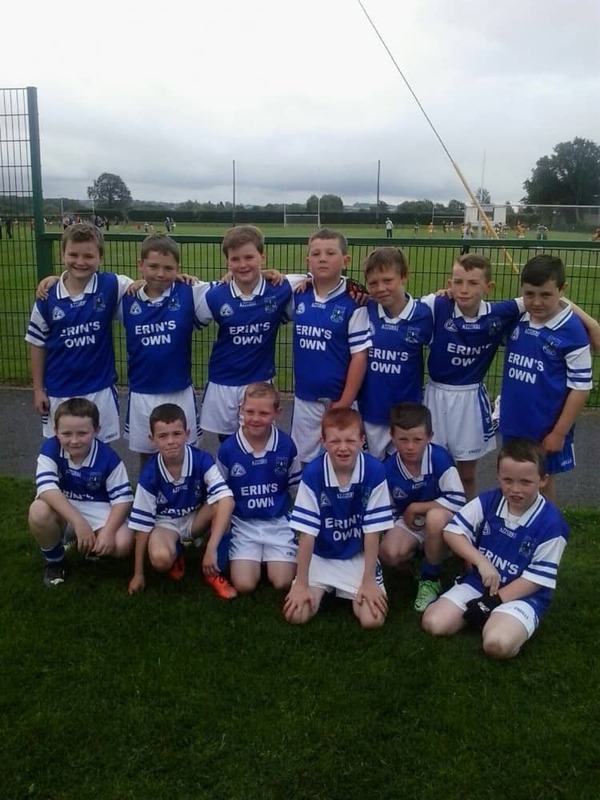 Erin’s Own travelled to Dublin last Saturday morning with a squad of 14 players to the prestigious Kilmacud All Ireland Tournament. They were pitted against Sarsfields, From Cork, Salthill Knocknacarra from Galway and St Vincent’s from Dublin. The Comer boys came through the round robin games very successfully with a big win in the first match against Cork outfit, Sarsfields. 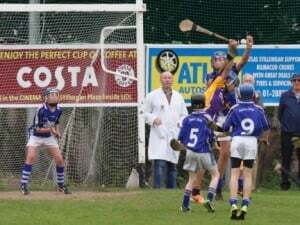 This was followed by the match of the day against Salthill Knocknacarra that ended up in a draw with Salthill pointing in the last puck of the match. It was a game played at a very high standard with the Comer boys unlucky to be caught on the line. The final game was a tighter affair against a physically bigger St Vincent’s side but again the locals seemed to always be in control and eventually run out easy enough winners. 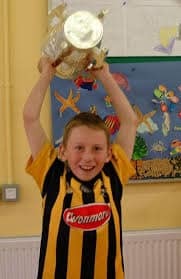 Erin’s Own finished top of their group as they had a better scoring average than second placed Salthill Knocknacarra. It was a local derby in the semi final with Comer going head to head with old rivals, The Village. This game proved to be a one sided affair as Comer just played the perfect match and the city boys, on this occasion, were no match. Comer ran out easy winners in the end. Erin’s Own had just qualified for the final and for the first time that day they had an opportunity to get a rest and prepare for the big match. The final was played before a big crowd of a couple of thousand people in Kilmacud Crokes Glenalbyn grounds. The performance was exceptional, the scores taken top class and the result beyond what they thought possible. Erin’s Own held their nerve lining up against a bigger Dublin side backed by a large crowd. This did not deter the Comer boys who were excellent from start to finish. Congratulations to each one of them on the way they played for each other and for their club. 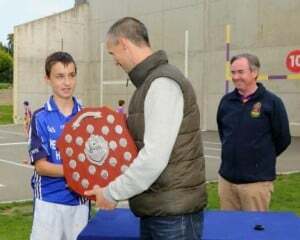 The Shield was presented afterwards by Tommy Dunne to Captain for the Day Christopher Korff. 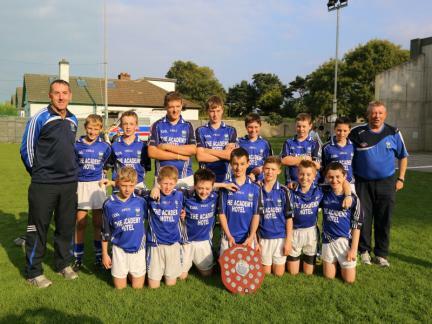 Congratulations boys, All Ireland champions. Erin’s Own have representation on all levels for the coming annual inter county tournaments this weekend and of course in the big 2 the following weekend. Best of luck to all the players involved and to John Buggy who will be managing the Tony Forristal team. 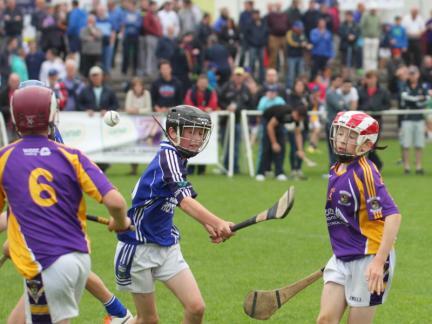 U14 – James Brennan, Cathal Holland, Declan Buggy and Conor McMahon. As a mark of respect to the late James Dormer all trainig sessions etc scheduled for tomoorow Monday will be cancelled. James was a member of Erins Own for over seventy years and contributed a vast amount to the club and was Vice President for many years. He will be fondly remembered by his many firendss an neighbours. The Sun was beaming down last Friday when Erin’s own GAA Club held its 9th annual golf classic in Castlecomer Golf Club. This event was sponsored by David Buggy Kia Motors, Kilkenny. Over 40 teams played on the day in both GUI & non GUI competitions. In the Main competition, the golf was most competitive with local team of Colm Meagher, Adrian O’Neill & Eamon Brennan proving victorious with a very good score on the day just narrowly beating Dunreidy Engineering Team of Colin Dunne, Michael Daly & Joe Tierney. In the Non GUI Category, winners were Nirvana Lighting Team of Ken Loughlin, Shay Loughlin & Martin Phelan. The organizing committee Congratulate all the winners & would like to thank all who played, the hard working ladies who looked after the Barbecue, Castlecomer Golf Club & its staff and anyone who assisted on the day to make the Classic a success. Special thanks to all our Generous Sponsors who continue to support the Classic. We acknowledge all those who supported by sponsoring a Tee Box, a team or a Prize. 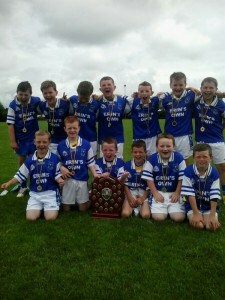 Check out the club website for the full list of winners and photos of the day. All of the monies raised go directly into the ongoing development in Ballycomey which will improve facilities for all members. 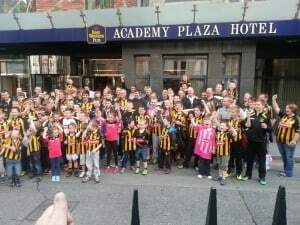 On Sunday last week Erins Own GAA Club brought three bus loads of enthusiastic young and not so young supporters to the Leinster Finals in Croke Park. A great day was had by all from start to finish with many of our youngest members having their first visit to the famous stadium. 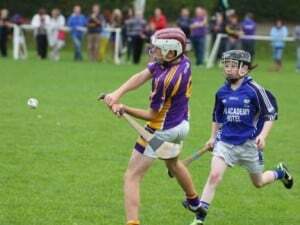 The Minor match set the youngster’s excitement rolling for the big match with a great win with our own Conor Delaney playing brilliantly at full back and Niall MaMahon on the panel. The senior match was the highlight for most of the travelling group of nearly 150 and with Senior Club Star Conor Fogarty having a storming game at midfield all were happy when the cup was presented to the Black and Amber players. Afterwards the large entourage were guests of Joe and Julie Comerford and their staff at the Academy Hotel where everyone was treated to a fantastic spread of food and drinks. It was then aboard Denis Buggy’s busses and back to Castlecomer. Special thanks to Denis also who always looks after the club on these annual trips. 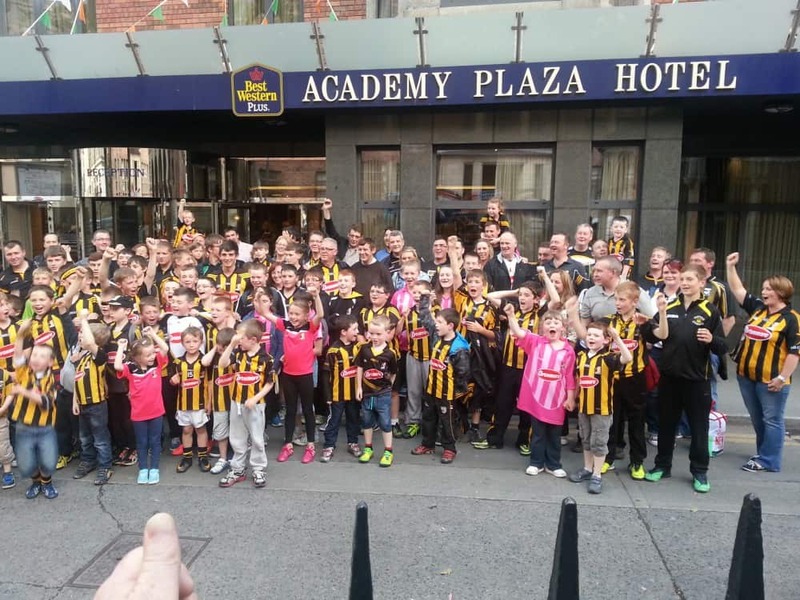 The picture attached is the happy group outside The Academy Hotel. Congrats to Erins Own U10s on winning the Kevin Bergin 2014 Tournament. Superb performance from all involved on Sat. 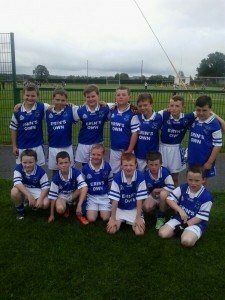 The Comer lads won their 2 matches in the group stages with wins over Windgap and St Martins. In the final they faced the hosts Conahy Shamrocks and won a superb match on a scoreline of 3-05 to 3-03. 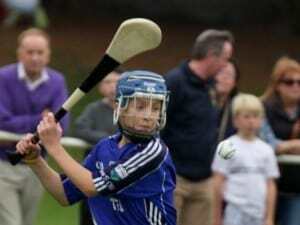 Thanks to Conahy for hosting a great mornings hurling. Panel was Kiel Smyth, Alan Smyth, Evan Harding, Ewan Connery, Eoghan Moore, James Kenny, John Kenny, Joey Ryan, Michael Brennan, Shane Holden,Mikie Maher, Eoin Nolan and Aaron Fanning. Well done everyone involved.